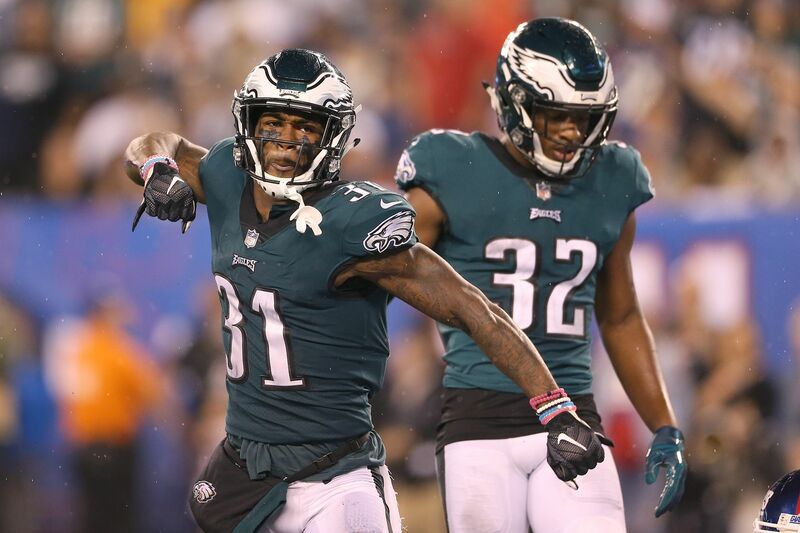 EAST RUTHERFORD, N.J. — Nobody else in the NFC East has what the Eagles have. Nobody else can even approximate it. We did not need to see what we saw on Thursday night to know any of this. But it was a reminder, and a strong one at that. In a 34-13 decimation of a Giants team that was its usual hapless, apathetic, dysfunctional self, the Eagles' offense turned in the kind of performance that should tamp down the neurotic hand-wringing that has consumed a significant chunk of the fan base and media over the past couple of weeks. "Today felt like last year," running back Corey Clement said. "I think that's what we need to keep stacking, realizing what we can do and who we really are." You saw everything you hoped to see, everything you needed to see. There was Alshon Jeffery catching eight passes for 74 yards and two touchdowns, with Carson Wentz targeting him 12 times. The connection between Jeffery and Wentz is one of those bedrocks that can stabilize an offense in tumultuous times. Three of Wentz's first six passes went to the big wide receiver, one of them for a touchdown, the other for a 17-yard first down on a touchdown drive that gave the Eagles a 14-3 lead with 1:28 remaining in the first quarter. In the backfield, Clement looked strong and smooth, getting to the edge and turning the corner on a 14-yard run late in the first quarter that helped set up his own 1-yard touchdown run. Early in the third quarter, he made a nice cut after catching a screen pass and scampered down the field for a 20-yard gain. Clement and Wendell Smallwood combined for 94 yards on 29 carries and another 26 yards on four catches. Those numbers are hardly overwhelming, but it is debatable how much blame belongs on the backfield and how much on an offensive line that suddenly looks nothing like the unit that paved the way for last year's Super Bowl. Of all the reasons folks have worried about this Eagles team over the past couple of weeks, the blockers are one of the legitimate few. Lane Johnson was already reportedly dealing with a high ankle sprain. Against the Giants, Jason Peters went down with a biceps injury. There are significant concerns here. But the Eagles also have an entire season to figure these things out, because there is nobody else in the division who is poised to take advantage of the early season hiccups. These are not good times for the NFC East. Heading into the night, the division's four teams each ranked among the NFL's 10 lowest-scoring teams. They all ranked in the bottom half in yards per play, passing yards per game, and point differential. By the end of Thursday night, one of those teams had begun a course correction. And it is tough to envision any of the remaining three making up ground. At this point, the closest approximation to a challenge appears to be the Redskins, who are coming off a 43-19 shellacking in New Orleans that somehow wasn't as close as the scoreboard made it appear. At 2-2, they are technically tied with the 3-3 Eagles for the division lead, their two victories coming over Arizona and Green Bay. But Washington is a team that has virtually no significant weapons on offense. Alex Smith might be enough to get you to the playoffs when he is managing an offense that features Tyreek Hill, Jason Kelce and Kareem Hunt. But Jamison Crowder and Paul Richardson are another story. The Cowboys will at least bring a competitive defense to the field each week, but they've failed to reach 300 yards of total offense in three of their five games, most recently in a 19-16 overtime loss to a Texans team that hardly looks like a serious contender. And then we have the Giants. If they weren't an embarrassment before, they most definitely are now. Their blockers can't block. Their quarterback can't throw. The body language on the sideline and in the huddle was astonishing to witness out of a veteran team this early in the season. There was Eli Manning gesturing wildly in frustration at backup running back Wayne Gallman after a missed connection in the first quarter. There was head coach Pat Shurmur caught by television cameras muttering exasperatedly after watching another one of Manning's check-down throws. There was Odell Beckham, less than a week after questioning his team's heart in a national television interview, departing the sideline for the locker room with 2 seconds still remaining on the second-quarter clock. They have the division's best quarterback. They have the division's best coach. And, on both counts, second place is not particularly close behind. For the last month, they haven't looked like the Super Bowl champs. Maybe they still don't. But they don't look like they are getting there. "We were close," tight end Zach Ertz said. "We just weren't sustaining it for four quarters. Hopefully this will spark us." In this division, they have as much margin for error as any team in the league.